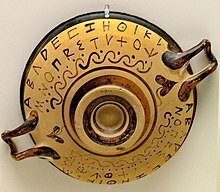 Létà tabi Ábídí je a grapheme in an alphabetic system of writing, such as the Greek alphabet and its descendants. Letters compose phonemes and each phoneme represents a phone (sound) in the spoken form of the language. Daniels, Peter T., and William Bright, eds 1996. The World's Writing Systems. ISBN 0-19-507993-0. Powell, Barry B. 1991. Homer and the Origin of the Greek Alphabet. ISBN 978-0-521-58907-9 | ISBN 0-521-58907-X. Àtunṣe ojúewé yi gbẹ̀yìn wáyé ni ọjọ́ 22 Oṣù Kàrún 2013, ni ago 18:44.